Quantifying the distortion of the PCM4222EVM board has been a challenge. It's better than any converter or signal generator I own. I decided to revisit the world of "Super Low Distortion Ultra Pure Audio Sine Wave Oscillators." These oscillators are usually fixed frequency with sub-ppm THD levels and are often used to evaluate A/D or capacitor linearity. The designs I looked at use either FETs, Silonex NSL32SR3 LED/Photocells or the SSM2018 for amplitude stabilization. My goal is to see if a THAT2180 VCA can be used for amplitude stabilization. The sub-PPM THD oscillators I found share a lot of common elements. J.L. Hood's 1981 Wien bridge oscillator using the National Semiconductor Silonex NSL395 LED/Photocell for amplitude stabilization. Bob Cordell's tuneable design uses a state variable topology oscillator and FET amplitude stabilization. The Cordell oscillator has an elegant yet simple rectifier section. "Oscillator Keeps THD Below 1 PPM," Smith, EDN November 10 1994. The "Smith" oscillator uses an SSM2018 VCA which is no longer in production. Bateman's oscillator, like Smith's, uses an SSM2018 VCA in an additive-type gain control. Only a portion of the oscillator's feedback loop flows through the SSM2018. The SSM2018's output adds a varying amount of signal to regulate level similar to "parallel" compression. 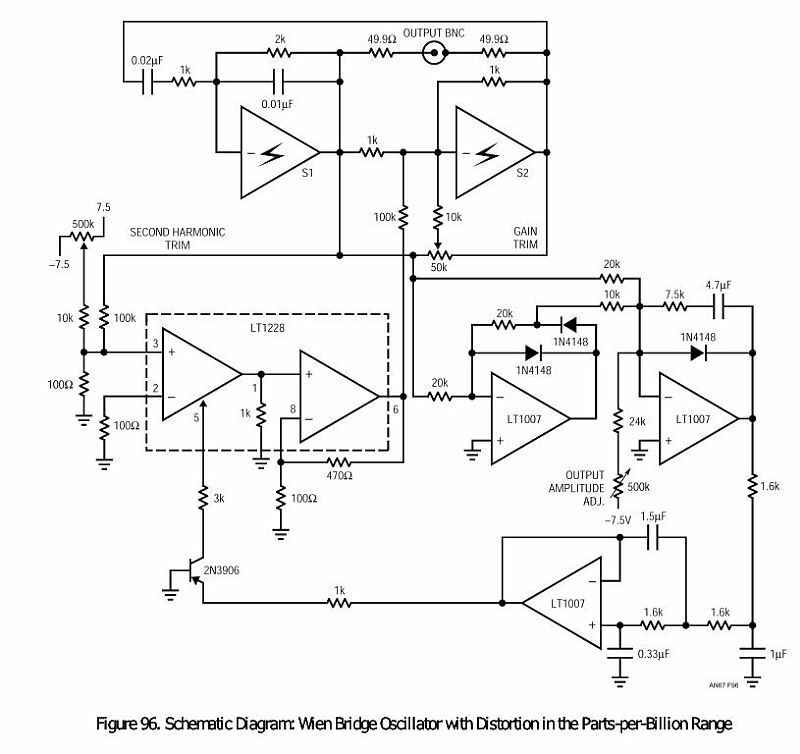 "Test 18-Bit ADCs with an Ultrapure Sine-wave Oscillator," Jim Williams, EDN, August 11, 2011. "An Ultra Pure Oscillator," Dale Eagar, Linear technology AN-67, 1996. Williams' and Eagar's oscillators use a Silonex NSL32SR3 LED/Photocell for amplitude stabilization. The NSL32SR3 is still in production and available from Allied Electronics, Digi-Key and others. The fate of CdS photocell production is uncertain however. The Mickevics' oscillator uses an available JFET, the SMT MMBF4391, which is a 2N4391. The through-hole 2N4391 is still available from Mouser. I built this oscillator and it performs very well. R14/R15 linearize T2 as well as shunt the FET to reduce it's delta-R. The use of IC1A to provide buffered linearity feedback to the gate is clever. I'm not sure what T1 does - I think it appears to "kick-start" the loop on power-up. The powering arrangement of this oscillator, using shunt regulators with no direct connection to supply ground, provides some advantages I'll cover later on. The Janasek oscillator uses the LME49710. It's schematic is the most easy to follow. If you look at the Janasek control loop you'll see that the NSL32SR3 is in parallel with an 18Ω resistor. The delta-R of the NSL32SR3 is about 150-60Ω at an LED current ranging from 5-20 mA. The net delta-R is only about 2Ω. 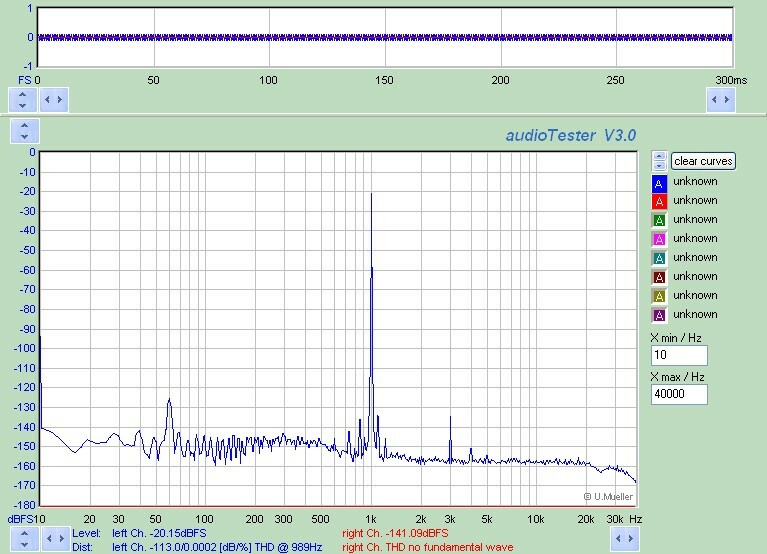 The gain change for stable operation is very, very small only about 0.005 dB. The criteria for stable oscillation requires precise level control in all of these designs. The Janasek, Mickevics or any of the previously cited oscillators can be easily modified to use a THAT2180 VCA using subtractive gain control. In order to optimize Janasek et al for use with a 2180 VCA a different approach was used to eliminate the 2180s I-V op amp and use the current output directly. The Smith and Bateman Wien bridge oscillators use the SSM2018 to add a portion of the feedback signal to itself to vary gain. The weighting of the VCA-controlled output is a fraction of the total feedback signal to reduce the amount of gain change versus the control voltage. In Smith, the ratio is about 50:1; in Bateman about 3:1. The SSM2018 is current-in/voltage-out and is non inverting. The THAT2180 VCA core is current-in/current-out and inverts polarity. 1) We take advantage of the 2180s current output and eliminate the I-V op amp and additional noise. At high gain reductions the 2180s noise is lower than the I-V stage resistor. Using the current output we eliminate a gain stage. 2) The inverting nature of the 2180 subtracts signal to control gain. Since we only need less than a dB of gain control (maybe 0.05dB?) the 2180 can operate in deep attenuation typically -50 to -30 dB. 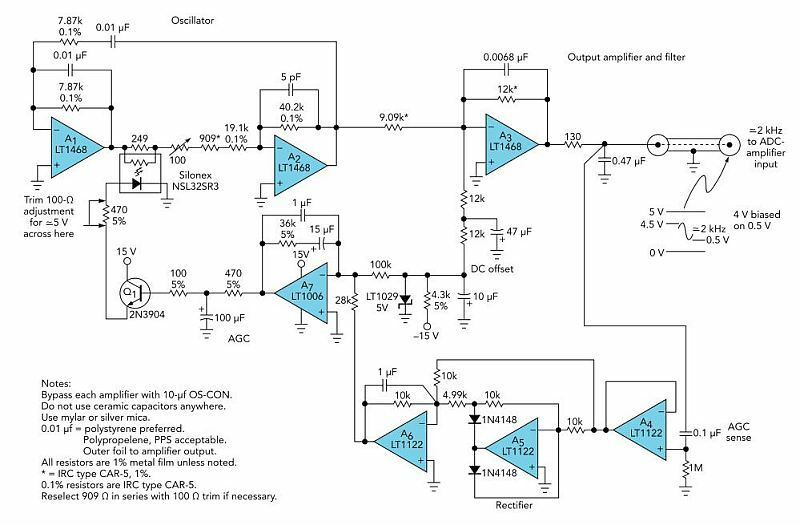 This reduces its noise and THD distortion considerably and allows larger amounts of control voltage to precisely control very small amounts of gain change. Due to subtraction of signal the control slope is backwards. 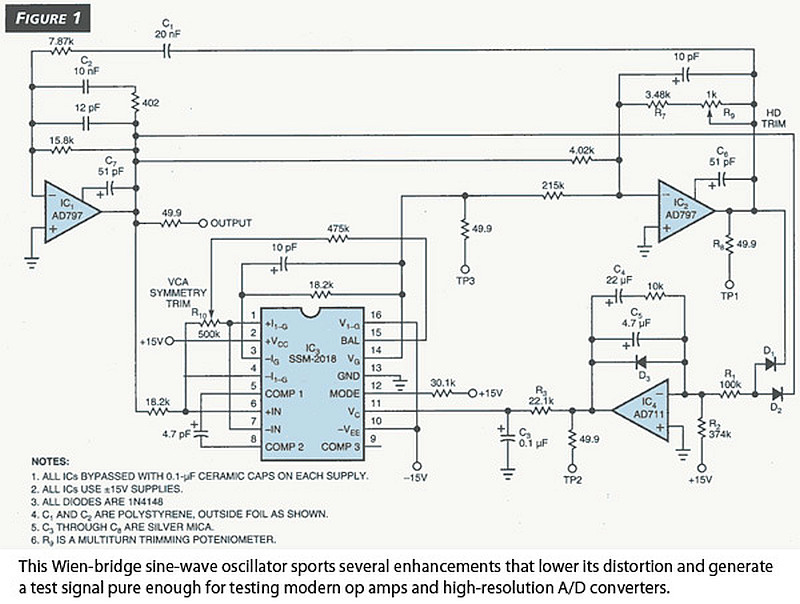 As the attenuation of the VCA decreases (VCA gain increasing) the output level of op amp A decreases. 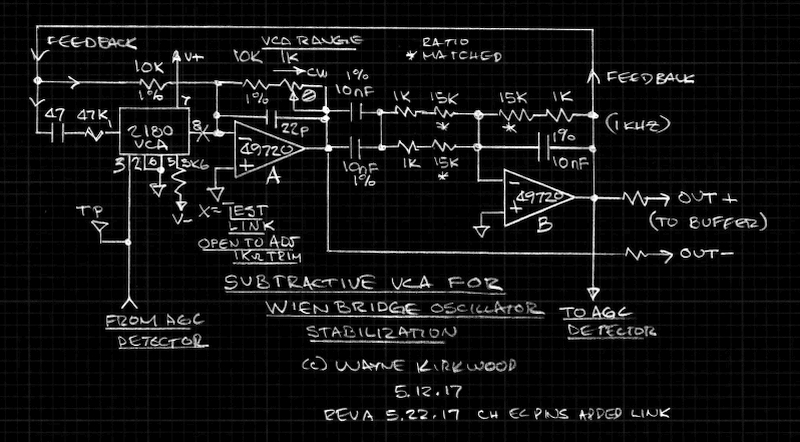 The 1 KΩ trim skews the gain of the Wien bridge inverter to set the amount of VCA attenuation when the loop has stabilized. Typical attenuation can range from about -55 to -30 dB. I'm currently using -46 dB VCA attenuation. As the 1 KΩ is varied, the THD and noise remains essentially constant leading me to believe the VCA is not significantly contributing to THD or noise. Output from my version is taken from both op amp A and B to provide a balanced output and a possible phase inverter for the level detector similar to Smith's. 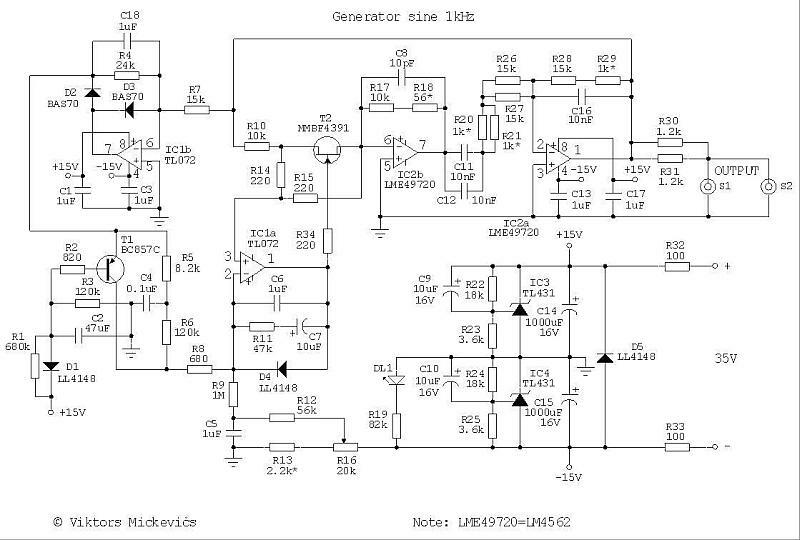 I built the Janasek oscillator using a THAT2180 VCA which allowed me to measure the distortion of the PCM4222. The combined oscillator and PCM4222EVM A/D THD is about 2 ppm. The oscillator was built on an open unshielded Protoboard and hum is indeed present. At 2 ppm - with quite a bit of the distortion likely the A/D - I'm within distance of sub-PPM performance. Without building a notch filter its difficult to prove that the residual distortion - which is exceedingly small - is in the A/D. What I have been able to determine is that the second and third harmonics drop into the noise floor just below -25 dBFS. To prove that it wasn't necessarily the oscillator I first looked at the THD level of the oscillator's unbuffered output. Regardless of how it was adjusted or configured the signature changes right around -25 dB FS. I then added a variable gain output stage. By increasing the oscillator's internal level and reducing the output level to compensate I was able to determine that the THD signature always changed at -25 dBFS regardless of what level the oscillator was running at internally. At very high levels (>10V P-P) I could see some rise in the oscillator THD itself but at the 1-2V RMS range it falls into the noise floor. What I'm observing around -25 dBFS is consistent with how the PCM4222 is specified. As Bruce Hofer has pointed out the possibility exists that both devices have higher distortion and the products cancel to make the measurement look better than it actually is. In order to further prove the purity of the source I need a notch filter like the ones described by Smith and Janasek. With the filter sets its possible to deeply null the fundamental, add gain so oscillator distortion rises above the converter noise floor and find the THD down in the mud. From this measurement you can establish that the oscillator is (or is not) significantly better than the converter. I'm confident that a THAT2180 VCA can be used to stabilize a sub-PPM THD audio oscillator. The control loop I used was similar to the Janasek with an additional op amp stage to provide the integration at the base of the LED driver transistor. In Janasek he discusses the narrow lock range. The VCA has a wide lock range. Stabilization on power up is very quick and the amplitude does not drift. The control loop is quite simple and the only improvement I think can be made is in the rectifier. The rectifier is fairly non-critical but can be a source of harmonics. The Smith, Bateman and Cordell rectifiers do not have op amps running open loop at zero cross and do not require reverse-polarity clamping. Here is yet one more recent low distortion osc project. https://groupdiy.com/index.php?topic=65 ... #msg830973 I don't know if he finished yet. I thought Cordell's JFET gain circuit was more clever than his rectifier, but I have probably dabbled too much in rectification schemes. Classic problem is making control loop slow enough for low distortion steady state, while fast enough that it settles in our lifetime. 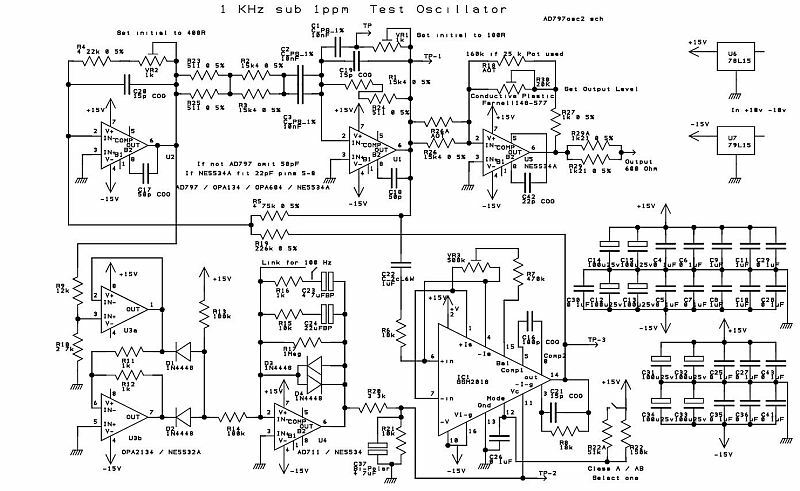 That was a real consideration in the TS-1 oscillator design (not very low distortion BTW and more than 1000:1 range on one knob with dB meter hanging on output made settling issues apparent). The trigonometry compensation method that I explored performs very well, although there are harmonic distortion products from the various nonlinearities of the 4 quadrant multipliers. With 3 untrimmed AD633s and 2 THAT2180As in the main control loop the performance is approximately -90dBc ,with 5 trims you could get the distortion products down another 10dB. For audio synthesis this method is wonderful as the distortion products are harmonic in a satisfying way, but in a lab I think it would be hard to beat the parallel topologies of the HP8903/Sam Groener/internal oscillator in Audio Precision analysers (the first model has a published service manual), Groener quotes -140dBc which is astonishing (if I recall though that one was so full of trims that it would never be feasible in a commercial product). I've explored and implemented a technique based on the THAT4301, the crucial reason for using this chip is the pin which allows current control of the RMS time constant. If it is possible to apply a voltage in parallel with the control devices that change rate of integration in the main control loop, then you can get around the primary limitation of RMS detection methods. Which are that for a variable frequency oscillator, either your settling time is too slow, or you get distortion from ripple that is worse than even the crudest AGC methods. My suspicion is that the 4301 dev team brought out the current control pin with this sort of application in mind,and the fact that you can just do it with a voltage and not muck about with a FET or similar is sheer genius. I'm getting the proto board back in the upcoming week, the unknown is how linear the response to voltage is, but the requirements for that are not too strict. Diffuse(?)... It looks like you have spent a lot of time on this. Did you ever mess with the trig identity (sin^2+cos^2=1) from quadrature outputs of a SVF to make a ripple free rectifier source? Of course this is never completely ripple free unless the two quadrature outputs are perfectly matched in level. I recall speculating with Brad Wood about this years ago (off list) and he shared a schematic by somebody using OTAs IIRC. I never cared enough to melt solder, and that schematic has long since disappeared into a failed hard drive bit hole. 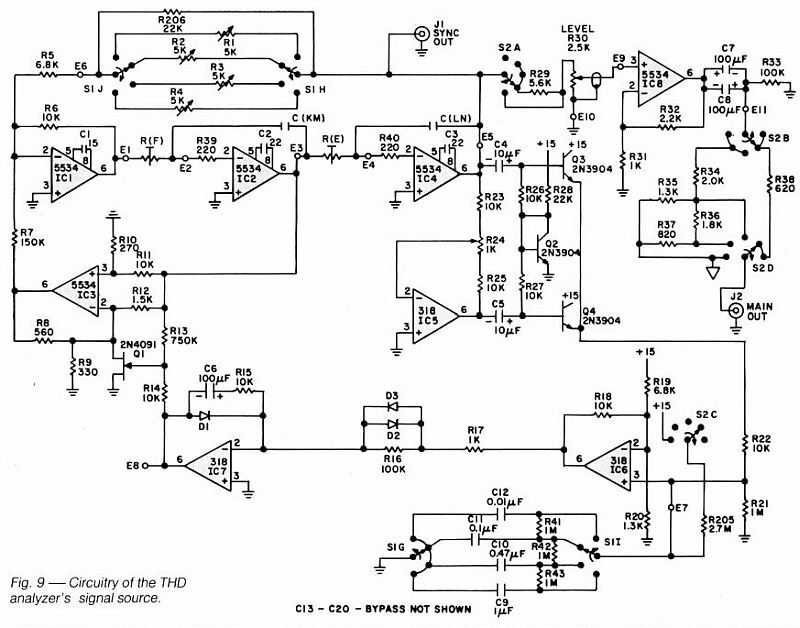 PS: Not to repeat common themes (of mine), but after exploring limits of DAC technology, I might investigate a hybrid or mixed analog-digital design where say a micro performs smart loop control using a DPOT or something similar for level stabilization. Of course any digital noise corruption would need to be managed. Thanks for your posts diffuse371 and JR.
Where is that AP SYS1 service manual located? Is a non-linear-capacitor useful in the AGC loop when using RMS detection? Someone at DIYAudio also referenced the OTA-based "squarer" to implement a "sin^2+cos^2=1" detector. I'm pretty much at the residual of the A/D at this point. The VCA is a non-contributor to THD at its high attenuation level but the detector ripple and circuit strays are contributors. The A/D used to measure them is also at its residual so I really need that notch filter. This is combined oscillator/PCM4222 THD with the 2180-based AGC loop using a variant of Viktors' detector. I haven't begun to address hum. I think most of what we're seeing is PCM4222. 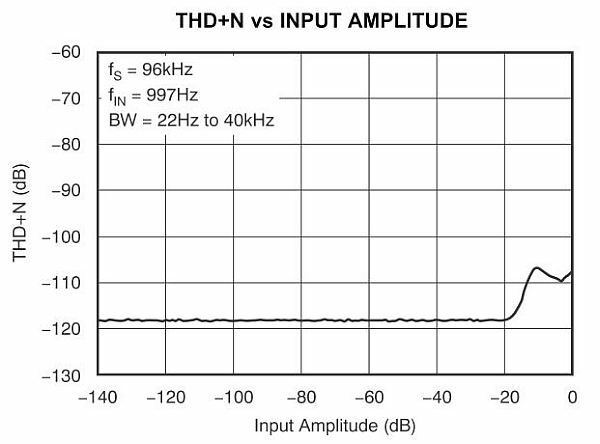 I recall when messing with the TS-1 design I could hear the 0.15% low order THD at some lower frequencies, but only under close (a/b) scrutiny. It was good enough for practical listening tests (speaker rubs, even tape machine line up). My goal was to have something better than the test and measurement A/D-D/A loop so I could quantify them. The 0.15% you got from the TS-1 is remarkable considering its simplicity. Loftec TS-1 State Variable Oscillator using LM13600 Operational Transconductance Amplifiers For Frequency Control with FET Level Stabilization. Thanks,,, I could have gotten the distortion lower by slowing down the loop time constant but as I previously alluded to, settling time is an issue with a 1000:1 adjustment range, and dB meter attached to the output. I messed around a little with adaptive time constants on the bench but in the end decided to KISS. This was before SMD so the PCB was a pretty full house, and there were no op amp sections left over. 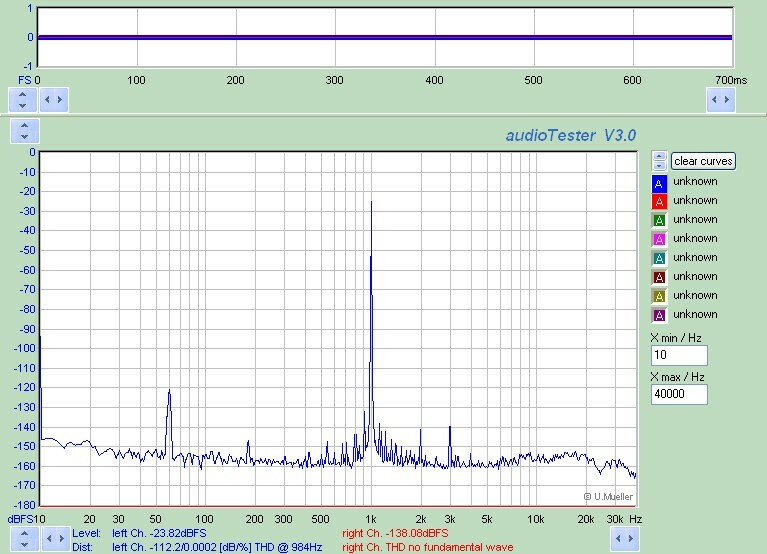 BTW my A/B listening test was switching a larger time constant cap in and out, in which case I could hear the distortion, but let it go as a trade-off, estimating I would get far more complaints about slow settling time. JR. wrote: Diffuse(?)... It looks like you have spent a lot of time on this. Did you ever mess with the trig identity (sin^2+cos^2=1) from quadrature outputs of a SVF to make a ripple free rectifier source? Of course this is never completely ripple free unless the two quadrature outputs are perfectly matched in level. Yes, that is exactly the topology I am using in a design and shared an early iteration of on my website (I credit Stanely Fifer's "Analogue Computation" series as the first to discover this technique, I believe it is also a favourite of Barrie Gilbert). The AD633 will beat the pants off of a common garden OTA. It is ripple free, the real time error value of the oscillator from the sine^2+cos^2-1 function contains a DC component and an AC component which is mostly phase error. Wayne, the AP System One service manual is on their site, it is necessary to register. I heard the engineer from the HP8903 moved to AP. I think the maths for RMS detection relies on a linear integrating capacitance? Yes, the non-linear capacitor deviates from RMS. It does reduce ripple for small input changes which might make it useful for the oscillator control loop. I need to re-register at ap.com.